The 2014 Bordeaux vintage got off to a good start. The winter months were exactly what the vines needed with their moderate temperatures and heavy rain. The water tables were replenished after a few years of drought conditions. In fact, rainfall was at its highest level since the 2001 vintage, making 2014 one of the wettest winters on record for close to 50 years. This led to an early bud burst in the middle of March for the 2014 Bordeaux vintage. An early start to any vintage is always a good sign. March was slightly warmer than usual, which was followed by a warm, sunny and dry April. Things were looking good. In May, temperatures cooled down and some rain fell. The flowering took place at a rapid pace, which is another good sign. June started off hot, continuing the trend towards a good quality vintage. But many vineyards also experienced problems with rot, odium and mildew. Those potential threats took place because the wet conditions in May were followed by a warm, sunny June, which created the recipe for unwanted, humid, tropical conditions. To combat this, extensive de-leafing for improved circulation for the grape bunches took place. Crop thinning was also important in both the Left Bank and Right Bank vineyards. Things were looking good, except for the severe hail storm that struck the northern part of the Medoc with a vengeance on June 8. Chateau Preuillac suffered severe damage, losing as much as 80% of their 2014 Bordeaux harvest. Coincidentally, the chateau was sold shortly after that. 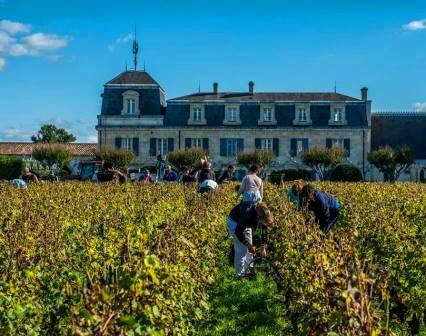 Growers remained optimistic with their fingers crossed for a successful 2014 Bordeaux vintage. Especially after the more than difficult 2013 vintage. It was still quite early in the season, but because June ended better than it began, the chateaux had high hopes. July wiped away any smiles. Sadly, July turned out to be a wet, rainy month with cool temperatures. Portions of St. Emilion were also damaged by hail storms. August, while reasonably dry was cool and at times cold, lacking the much needed, warm, summer sun. That is always a problem when the grapes are busy with veraison. The start of September was not a big help either, with its moderately damp weather. But like most people know, especially when it comes to viticulture, “It ain’t over til’ its over!” The fat lady was not ready to sing. 2014 Bordeaux had all the looks of a moderate growing season, (Moderate was probably being charitable) when things began to turn around. The weather warmed up and the sun started to shine. The start of September brought smiles to grower’s faces as they were thrilled to see 10 straight days of unabated, warm, sunny weather. The warm weather helped dry the vineyards to some extent as rain once again dampened the 2014 Bordeaux vintage. 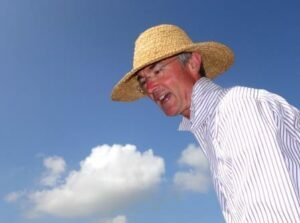 Growers began the harvest for the Sauvignon Blanc and Semillon grapes for dry white Bordeaux wine in early to mid-September under good conditions. The dry white wine grapes were all brought in by late September. September 17 brought more rain. In Pomerol, more than 50mm, (2 inches) of rain fell over a 48 hour period. The rain helped add much needed nutrients, while also pushing the 2014 Bordeaux harvest back a bit for the Merlot, which aided in the maturity cycle for the grapes. Following that rain, the remainder of September finished with a blast of perfect conditions for the 2014 Bordeaux harvest, making 2014 September one of the hottest, sun filled months in decades! September was also one of the driest months in more than 40 years! The early start to October picked up where September left off, with good conditions. From that point forward, and for the rest of the week, the 2014 Bordeaux vintage experienced more good fortune. Conditions were moderate during the day, at close to 70 degrees Fahrenheit, (21 Celsius) during the day with nice cool nights that droedp to 49 degrees Fahrenheit, (9.5 Celsius) which is exactly what the doctor ordered because grapes develop more acidity with the cool night temperatures. Although, with 2014 Bordeaux, growers were hoping for more sugars to develop, as the acidities were still a bit too high, least for some American palates. 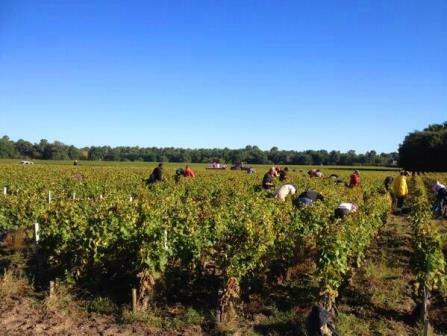 The harvest for the Merlot in Pomerol was in full bloom within a few days of September 22 under warm sunny conditions. This was quickly followed by picking Merlot in Pessac Leognan and the Medoc. Most growers in St. Emilion were still waiting for more ripeness in the grapes. By early October, picking had commenced for the Cabernet Sauvignon in the Left Bank. Cabernet Sauvignon was picked at a leisurely pace. Most of the fruit was brought in by Monday, October 20. Although a few vineyards, with cooler terroirs were still not finished harvesting. At the end of the day, quality was better than expected and fortunately for growers, the quantity was up from the dismal amount of wine they had to sell from 2013. Yields were expected to be on average more than 10% higher than in 2013. The long growing season and the beautiful conditions from late September through October are said to have saved the day. The dry white wines of Bordeaux once again appear to have been quite successful making it 10 years in a row, for quality white Bordeaux wine. 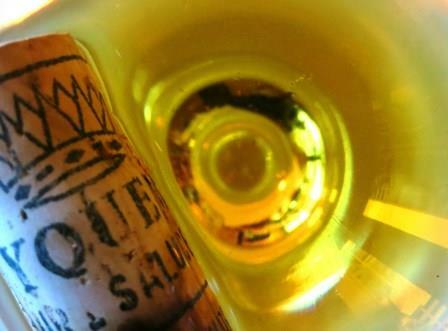 Sauternes and Barsac had another good harvest for their sweet white, Bordeaux wine. At the end of the day, stats, dates, weather and numbers do not tell the entire story. You need to actually taste the wine. Which is what tasters will be doing starting March 30. Besides, if we all knew about the quality of a wine from vintage and harvest reports, what fun would the 2014 Bordeaux En Primeur tastings be? I’m excited as today I’m starting to taste 2014 Bordeaux with a few chateaux from the Right Bank. 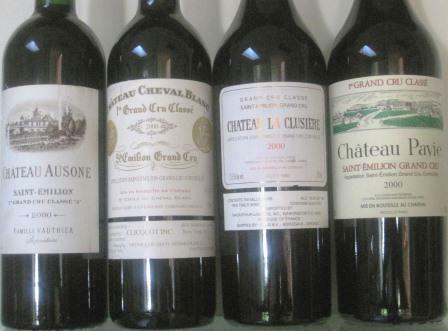 This will be followed by the wines of Pessac Leognan, the wines of the Medoc and then more from Pomerol and St. Emilion. It looks like a fun vintage that has the chance to spark collectors interest. The continuing strength of the dollar could make 2014 Bordeaux interesting for the American market as well. That is, if chateaux price the wines correctly for the 2014 Bordeaux vintage and the marketplace. I can only hope they realize that without Robert Parker, it’s a brave new world. The strength of the dollar should not entice owners to raise price. They should look at the value of the dollar as the good fortune of the American market and use it to bring Bordeaux wine back to the position as the world’s more popular, exalted and collectible wine. The Bordeaux market has been soft in America since 2005. It was good, but not great for 2009 and has languished since the 2010 vintage. I truly hope 2014 Bordeaux wine is seen as a way to win back the hearts of consumers and earn its rightful place in cellars, restaurants and dinners in America. This can be easily done by listening to the market and the prices consumers are willing to pay. Thanks for the report Jeff. When will you publish your notes on 2014 Bordeaux? It’s a birth year for our twins, so we want to know if there are any wines we have to buy.